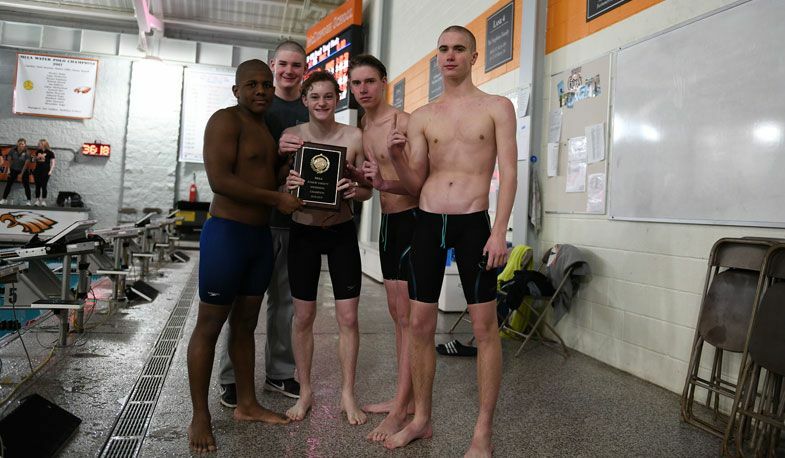 The MIAA Swimming Championships took place Saturday, February 2, at McDonogh School. Our varsity squad took 2nd place behind McDonogh, and our JV squad took home the championship. View photos from the meet here, courtesy of Gerry Lindner, P '19. Matt Clark broke both the MIAA record and our school record in the 200m IM with a time of 1:48.52. He got 1st place in that event. Matt also won the 100m Breaststroke with a time of 56.84. Will Pelton took 1st place in the 50m Free in a time of 21.23. Zach Reid took 1st place in the 200m Free in a time of 1:41.27. Ryan Brannon took 1st place in the 100m Fly in a time of 50.48. Ryan Brannon, Matt Clark, Zach Reid, and Will Pelton took 1st place in the 400m Free Relay with a time of 3:05.58. Congratulations to our swimming Dons on another great year!